It’s pizza night again, and this week, we are having a more traditional pizza, but I’m still skipping the tomato sauce. This pizza crust was brushed with chopped garlic sauteed in olive oil. The crust was then topped with Mozzarella cheese, Parmesan cheese, and then dusted with Italian seasoning. Italian sausage, canellini beans, and shredded kale were artfully arranged on top, then the whole thing was placed in the oven. Actually, I randomly scattered the toppings, but doesn’t artfully arranged sound better? The final pizza was simple and delicious. 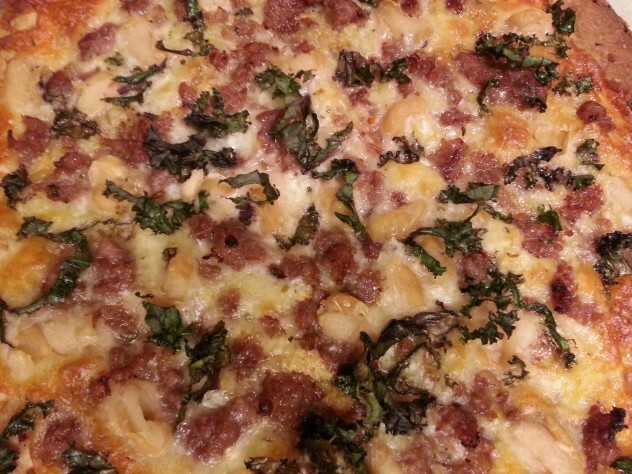 Who knew that beans and red kale on a pizza could be so tasty? Here’s the printable recipe. Give it a try and let us know what you think. 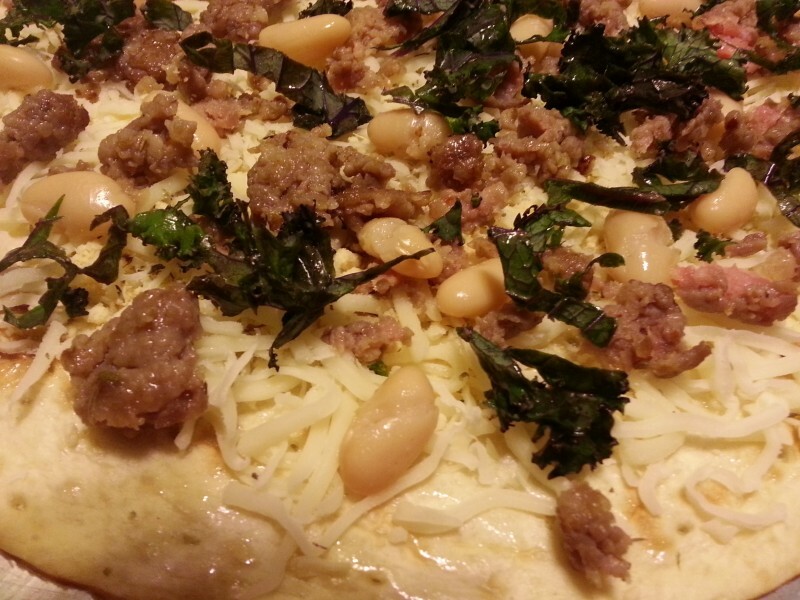 Cannellini beans, kale, and Italian sausage make a flavorful topping for a olive oil and garlic coated piza crust. Brush crust with olive oil and scatter sauteed garlic evenly over the crust. 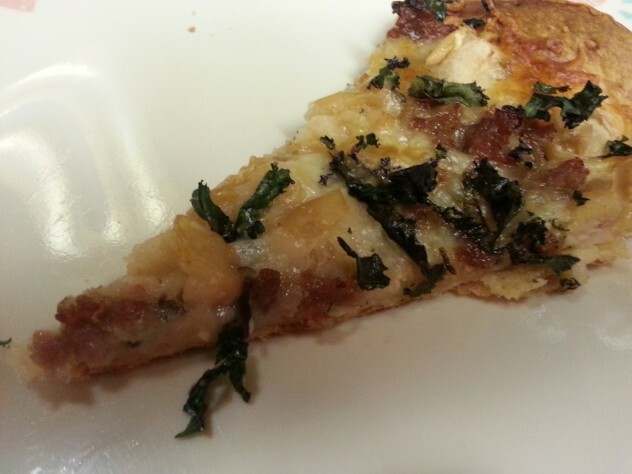 Sprinkle Mozzarella and Parmesan cheeses evenly over the crust. Sprinkle pizza with Italian seasoning. 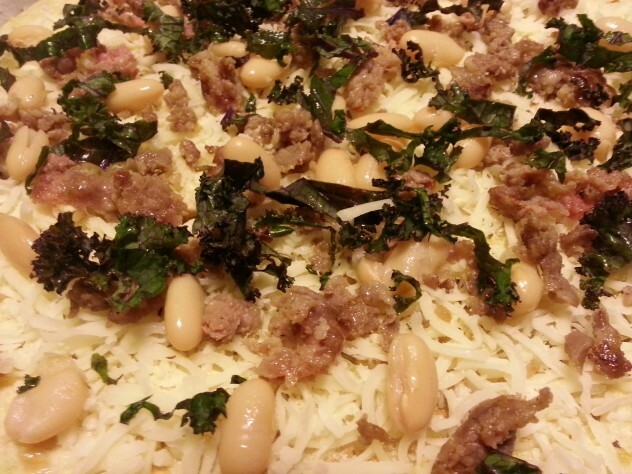 Top with cooked sausage and beans. Scatter shredded kale over the top. Bake on a cookie sheet in a 425 degree oven for 15 to 20 minutes or until cheese is melted and crust is lightly browned. Thanks for the compliment. It’s a challenge to keep coming up with new bean recipes every day.